Francys Johnson, the 38-year-old civil rights attorney and pastor from Statesboro, stepped down as president of the Georgia NAACP Saturday at the 108th National Convention in Baltimore. 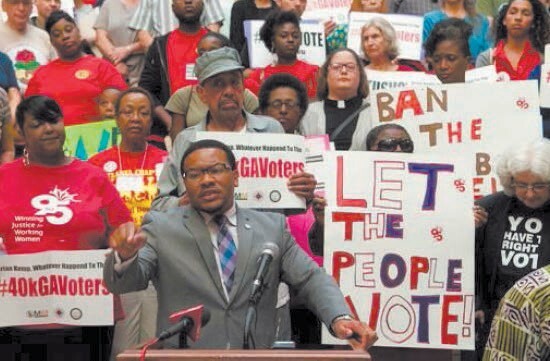 Johnson is credited with restoring the voting rights litigation prowess of NAACP in Georgia while attracting younger professionals and bridging the gaps in Georgia between millennial activists groups such as Black Lives Matter. “Francys Johnson lent his talent, time and treasure to the Association at a critical time. “I don’t think we’ve seen the last of his leadership,” said Derrick Johnson, newly appointed Interim President and CEO. Johnson, who has been mentioned as a possible challenger to Rick Allen (R-Augusta) in Georgia’s 12th Congressional District, 100 Edgewood Avenue, Suite 1610, Atlanta, Georgia 30303, flirted with what’s next for the father of two in prepared remarks: “Our nation is in crisis. This moment calls for every head, heart, and hand to engage the work of ensuring that all the promises of our democracy are fulfilled. The upcoming election in 16 months carries consequences unlike any other mid-term in our lifetime. This election will either reinforce and sustain the path we’re on — or change it. I promise no one will work harder to turn this momentum for change into a reality,” said Johnson. While Johnson stopped short of an announcement; the NAACP rules require officers to step down to run for public office. The day stirred many emotions for Johnson who served 30 years within the NAACP at every level including Youth Council, College Chapter, Adult Branch, State Conference and previous service on the National Staff as the Southeast Regional Director. “It’s emotional to step away from doing something you love,” said Johnson. “Street heat and legal teeth were the hallmark of Johnson’s leadership with the Georgia NAACP. He brought his marching boots and law books,” said Graylan Quarterman, a member State Executive Committee. During Johnson’s tenure that Georgia NAACP filed ten (10) federal or state lawsuits addressing racialized redistricting, voting caging and purging, as well as at-large voting. “He was as comfortable leading the powerful demonstrations across Georgia in response to police-involved deaths of citizens and the Atlanta March for Women and Social Justice, the largest protest march in Georgia history at 63,000 protesters, as he was giving an argument in Court or sermon in the pulpit. That takes a rare combination of talents,” said Rev. Raphael Warnock, Senior Pastor of Atlanta’s Ebenezer Baptist Church. Johnson’s departure comes at a critical conjuncture where the venerated organization’s relevancy is being openly questioned. “You can’t look at young folks and say you’re going to be the leaders of the future. You have to give them the opportunity to lead now and that’s what the NAACP believes,” said Leon Russell Chairman of the Board of Directors for the NAACP. “He walks in the footsteps of the greats including Savannah’s Ralph Mark Gilbert and W.W. Law; Macon’s Julius Caesar Hope; and Madison’s Walter Curtis Butler. As a scholar, a practitioner of law, and a dynamic young leader, Johnson raised the bar of excellence and made the NAACP more attractive to young professionals” said Russell. The NAACP National Convention ran July 22 – 26 at the Baltimore Convention Center.